The ongoing nature of the open-access debate reveals the core of the problematic facing open-access journals: that while it is now deemed safe to use online scholarship, it is still not entirely safe to produce it. Despite these residual qualitative doubts, Mitchell notes that all ‘stakeholders’ in academic publishing have acknowledged that ‘open-access journals are cheap, fast, and quantitatively sound’. It is precisely these qualities that can make them an ideal vehicle for those who need quickly to get their work out in public; indeed, e-publishing can provide an ideal ‘shop window’, akin to the giving of a good conference paper, for early career academics. 16:9 (Eng-lang articles in Danish Film Studies Journal); Americana (Hollywood) : the Journal of American Popular Culture; Consciousness, Literature and the Arts; CTheory.net; Culture Machine; Fibreculture Journal; Film-Philosophy; Framework [online sections]; Genders; Image [&] Narrative; Intensities: The Journal of Cult Media; International Journal of Žižek Studies; Irish Journal of Gothic and Horror Studies; Journal of Moving Image Studies (archive online); Journal of Religion and Film; Jump Cut; M/C Journal: A journal of Media and Culture; Media History Monographs; Mediascape; Middle East Journal of Culture and Communication (first issue 1 online); P.O.V (A Danish Journal of Film Studies – peer-reviewed since December 2007); Particip@tions; PsyArt; Scope: an on-line journal of film studies; Screening the Past; Senses of Cinema; Trama y Fondo (in Spanish); Transformative Works and Cultures; ; Vectors; Wide Screen (new journal calling for papers); World Picture Journal. I hope to return to discuss issues of (and matters concerning) the above-listed journals on future occasions, but I wanted to focus, in what remains of today’s blog entry, on profiling three of the best examples of e-journals that are produced primarily by Film and Media Studies graduate students. I think they are producing some of the most interesting models for online, Open-Access work in our discipline(s) (and all are linked-to by Film Studies For Free). The main advantage of Flow is clearly its prodigious responsiveness. But there’s another feature that I really like; while the journal seems not to be conventionally (or ‘fully’) peer-reviewed, its excellent comments feature means that the exchanges provoked by the journal are open and critical – work published there can be publically and thus very usefully challenged. For example, see Flow Journal, Vol. 8, Issue 7: this issue featured columns from Jane Feuer, Aaron Delwiche, Leigh Goldstein,and Alexander Cho. Flow staff writer Leigh Goldstein’s great piece“Soft Selling Intergenerational Intimacy on the First Season of Mad Men” examined ‘the unmasking [in that series] of society’s discomfort with representations ofchildhood sexuality’. It sparked nine very well thought out comments which were reproduced on the same webpage, including a very interesting comment from the renowned film and TV studies academic and theorist Karen Lury, who has also contributed her own work to Flow (also see HERE), alongside another fascinating point posted by the great Julia Lesage. You can’t get better, or more instant and transparent, review by your ‘peers’ (or, indeed, by your ‘betters’) than that! Flow is well worth a (free) subscription, in Film Studies For Free‘s humble opinion. After a four year hiatus (of the kind that is sadly still all-too-common in the volatile world of academic e-publishing), SYNOPTIQUE: The Journal of Film and Film Studies, a film journal written and published by graduate Film Studies students at Concordia University in Montréal, is back. [I]t is only with the frame of a film community that we can think about film. And its education. We wanted to create an online resource of student work at Concordia. For students at Concordia. To give expression to the intellectual character of M.A. Film Studies at this University by publishing what was rapidly becoming a lost history of ideas. Students work here for two years, take classes, write theses, go on their way, leave faint traces, might never take a stand or apportion an opinion. We wanted to discover what tradition we had inherited, what debates we were continuing, which debates we weren’t inventing. While the articles do have a slight ‘graduate flavour’ in places, they are very well-written and edited, and are as compelling and interesting as you would hope any article in a film journal would be – some very nice essays, in particular, on childhood in avant-garde films, Lynch’s Inland Empire and Potter’s Orlando, among others (in English and French). Synoptique also has options for leaving public comments, although its traffic is not currently as lively as that of Flow. Film Studies For Free wishes it all the best: it deserves a long and garrulous life. — as well as by possibly even more redoubtable figures, such as Slavoj Žižek ( “The Family Myth in Hollywood”; see also HERE). 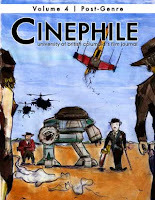 In the (re)launch issue of Cinephile (on a new website, equipped with an RSS feed to keep you updated, as well as with a comments facility), there are some wonderful articles by familiar names (both from previous issues of (UB)Cinephile, as well as those of such well-established luminaries as Barry Keith Grant). But there are also some very worthy pieces by some new(er) names (such as the timely and important ‘Cinema from Attractions: Story and Synergy in Disney’s Theme Park Movies’ by my fellow blogger Andrew Nelson, a PhD student in Film at the University of Exeter). In any case, the result for Cinephile continues to be a stream of highly invigorating articles, written in a throroughly engaging, and occasionally even entertaining, way. Inspiring, indeed. Also, look out for Tischfilmreview, to be launched later this year by the world-renowned Tisch School of Film and Television, NYU. Like Flow, Synoptique and Cinephile, its anchor in an educational institution of excellent repute would seem to be a great way of guaranteeing the ongoing archiving of the work it publishes, as well as of raising the profile of those whose work it will showcase online. We may go on to see the birth of literal-but-virtual ‘Schools of Thought’ in film and media studies (hmm: always remember Birmingham…). Maybe these newer, online ones are being forged in a more ‘open and accessible’ environment than was previously possible for participants in our disciplines, if only technologically. Do, then, consider yourselves urged to visit the Cinephile, Flow, and Synoptique websites. And also, as (if not more) importantly, please think seriously about submitting your research ‘outputs’ to them for consideration for publication, as well as to the other e-journals mentioned earlier in my discussion, and permanently linked to by Film Studies For Free. It may seem a volatile ‘marketplace’ out there in cyberspace, as elsewhere. But do you really have anything to lose except your reluctance?